Share the post "Papery Peep December"
Welcome to the final Papery Peep of 2014! I have so enjoyed running this, seeing your pretty and interesting paper, and sharing my own, so it will definitely be continuing in 2015. If you’re new here, it’s all simple enough. I’m inviting you to pop by and link up any papery posts – perhaps a new book you’re loving, some snail mail you’ve received, or as in my case today, share any paper pressies you’ve received.. Some goodies from Smiggle, some fab pens and erasable pencil crayons from Faber-Castell, a fairy writing set from Phoenix cards, Frozen stickers and some cute little notecards (she has many more designs!) that my mum bought for her. Oh, and of course she had several books, too. And me? Oh, December saw me have a few bits sent my way and Christmas was good to me and my paper! Here’s what I have had…. A lovely pen friend sent me the notebook pack, my mum bought me the diary and pen and then the fab Tia at Who Ate All My Crayons sent me the notebook. I’ve never read anything by this author before, so I’m hoping it’s good and I’ve found a new favourite. It was from my mum, too, along with the bookmark, as you’d probably have guessed! My brother got me the stickers, so cute! And then my mum bought me the blank recipe book, which is much appreciated as I’ve started to accrue bits of paper with recipes written on them and I worry I’ll lose them soon! Love, love, love this! It feels like a huge commitment, even though it’s only one line, but every day for 5 years seems a lot! I will be giving it a whirl, though, as it should be interesting to do. The journal is another gift from my brother and sister-in-law. Still pondering what to use it for, it’s just so pretty! This one I received just before Christmas, a Faber-Castell rollerball pen, which I’m a little bit in love with! This is a bundle of sticky notes and jotter pads perfect for lists and organising. It was from my parents-in-law, and the design is the same as the beautiful writing set they bought me…. Hmm, I’m finding it tricky to choose a favourite! What do you like? And now it’s your turn to share. Grab the badge in my sidebar, link up your post below and pop round and comment on the others. I comment on and tweet every post out, too. Linky closes at midnight Tuesday 6th January. 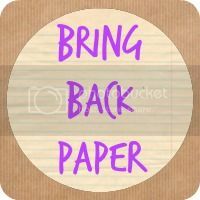 Thanks for sharing with and supporting #BringBackPaper. I’ve more lined up for 2015, including a challenge that I’ll reveal next week. In the meantime, I’d like to wish you all a Happy New Year. It’s sooo pretty! What to do with it, though? Will ponder…. I like that plan. Today I will begin! I am about two months in to the exact same memory book and I’m really enjoying it. It’s so pretty too! Donna recently posted…New Year = New Blog! Gorgeous gifts! I love everything, you are one lucky lady. oh look at all the pretties *strokes screen* love it all!